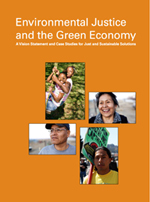 Our report Environmental Justice and the Green Economy: A Vision Statement and Case Studies for Just and Sustainable Solutions can be downloaded now from this site in both English and Spanish editions. This report is the follow-up to the “Stimulating Environmental Justice” statement released on this site in early 2009. This report describes a shared vision for a just and sustainable economy, and highlights grassroots environmental justice successes in our communities that are leading the way. We hope to stimulate discussion and build consensus around the idea that sustainability and justice – “justainability” – must be simultaneous results; that one simply cannot happen without the other. 1. Strive for full democratic participation. 2. Build capacity for a truly sustainable infrastructure and green economy. 3. Create and share “green” wealth. We hope that you will use this publication in your organizing, leadership development, policy making, research, and public education efforts. Please help distribute this report to all who are striving towards a “justainable” future.